NHL News : Canadiens must make another move within the next few hours. Canadiens must make another move within the next few hours. The Habs must make a move. The Montreal Canadiens have shown their hand somewhat with a series of moves made today in an effort to shake things up on what is likely to be the team's fourth line. Earlier today the Canadiens pulled off a rather nice looking trade from their perspective when they acquired veteran forward Nate Thompson as a rental. In that deal the Canadiens gave up no corresponding player and instead merely bumped themselves down ten to fifteen spots in the 2019 National Hockey League Entry Draft by trading a fourth round pick that had once belong to the Calgary Flames to the Los Angeles Kings who sent back a fifth round pick that once belonged to the Arizona Coyotes. On top of the trade with the Kings the Canadiens also made the anticipated move of calling up veteran forward Dale Weise from the Laval Rocket to their main roster. Weise was acquired as part of a 4 player trade deal with the Philadelphia Flyers last week and although he was immediately transferred to the American Hockey League there was an expectation that he would be called up in very short order. That move as well as the acquistion of Thompson however has now left the Canadiens and general manager Marc Bergevin in a pickle. The Canadiens have, according to a report Cap Friendly, now exceeded the NHL's 23 man roster limit and will have to make a corresponding move prior to 5 pm this evening. That leaves Bergevin and the Canadiens with very little time to pull the trigger on another move and many suspect that another trade is to be expected from the Canadiens. 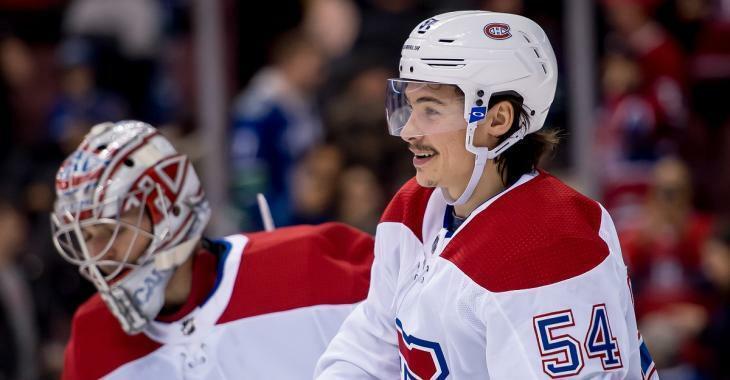 There have been rumors floating around regarding the future of young Canadiens winger Charles Hudon and those rumors picked up considerably over the week end. Hudon was made a very late healthy scratch on Saturday when the Canadiens faced off against the Maple Leafs, and Sportnet's NHL insider Elliotte Friedman hinted at the fact that it was likely trade related. According to Friedman the Canadiens had previously been seeking a mid round pick in exchange for Hudon, and a deal of that nature would be exactly what the Canadiens would need to get their roster in compliance. This is all speculation of course at this time, but keep an eye out for this one.